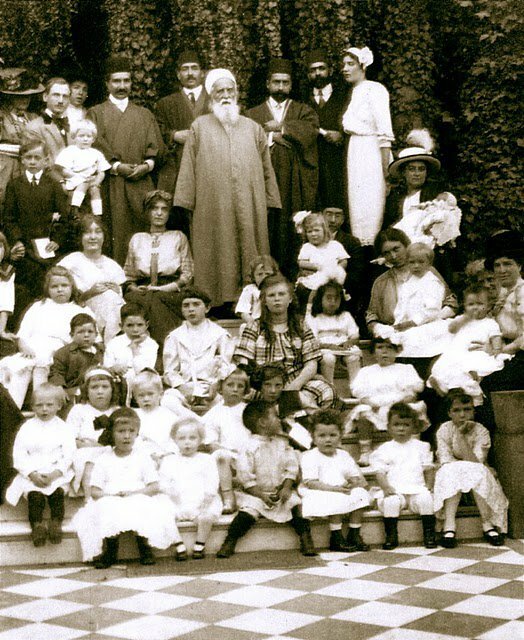 'Abdu'l-Bahá's Journey in the West . . .: October 1, 1912 A joyful reunion! "Tonight the train carrying the beloved Master reached the shores of the Pacific Ocean. Dr [Frederick] D'Evelyn, a devoted Bahá'í, came running as soon as he saw the Master and prostrated himself at His feet. On the way to the city Dr D'Evelyn described for about 15 minutes the yearning of the friends and how they longed to see the Center of the Covenant. When we reached the house especially prepared for `Abdu'l-Bahá the waiting friends came out to welcome Him. Mr and Mrs Ralston, Mrs Goodall, Mrs Cooper and the other friends were ecstatically happy to have the honor and bounty of being in His presence and to have supper with Him." On Oct. 1: "From early morning the enthusiasm, eagerness, excitement, joy and singing of the believers surrounded `Abdu'l-Bahá, just as in the stories of the iguana and the sun and the moth and the candle. It was the ultimate example of a joyful reunion among the lovers of God. These ecstatic friends offered thanks for the bounty of attaining His presence and being near to Him. `Abdu'l-Bahá continuously gave thanks for the confirmations of the Abhá Kingdom and for the power and influence of the Cause of God and encouraged the believers to proclaim the Cause of God. At noon He went for a walk and then took a little rest. I will describe `Abdu'l-Bahá's residence, as He saw it, because it is unique among all the homes in America which have been graced by Him. It is situated on an elevated plot of land on a wide street surrounded by a spacious garden. `Abdu'l-Bahá would approach the house, climb a few steps and stand on the porch where He would see fragrant flowers and plants set in pots around the veranda and porch. When the Master entered the house, He would see on His right three large rooms, decorated with fine furniture and many varieties of flowers. Each room opens on the other by means of wide doors covered with velvet curtains, which, when drawn, create one large hall. Every morning and afternoon the hall is filled with so many friends and seekers that there is standing room only. Many who seek private interviews meet Him on the second floor. On this second floor, accessible by a carpeted staircase, there is a large room occupied by some of His servants and to the left a small tea room. Across the hall is another room occupied by the Master. Attached to this room is a tea room and a bathroom. Situated in a corner of the house, the room commands a view of a large part of the city. At night the lights of the city appear like twinkling stars. Here many Americans, Japanese and Hindus come into `Abdu'l-Bahá's presence one after another. Each one has a question or statement to make. Many of the friends bring their children, supplicating His blessings and requesting Persian names for them. One of the Japanese friends at Mrs Goodall's home in Oakland asked the Master for Persian names for his two sons and `Abdu'l-Bahá gave them the names Hasan and Husayn. The third floor, where we have our rooms, is identical to the second floor. We each have our own room and are able to be close to the Master. The kitchen and dining room are on the first floor where some of the friends have the honor of dining with the Master at His table. At each dawn, after offering prayers of gratitude, the Master calls His servants and serves us tea with His own hands. Using stories and narratives, He explains issues relating to the blessings of God and expresses gratitude for His divine confirmations. Later the friends arrive to experience the bounty of being with Him and to give praise. Whenever a group assembles, the Master comes downstairs to speak to them about great and lofty matters. Before both lunch and dinner the Master takes a walk or goes for a ride. Mrs Goodall, Mrs Cooper and Mr and Mrs Ralston send two automobiles every day for His use. Whenever He goes out, the friends watch Him from the doors and windows of their houses. Even among the seekers there is much excitement. `Abdu'l-Bahá is reverently received at the churches by the clergymen. Each respectfully accompanies Him to the pulpit and introduces Him to their congregations with glowing praise. They speak of Him as the Prophet of the East, the messenger of peace and tranquillity and attest to His great station and the importance of the teachings. Following His addresses at the meetings, crowds of people continually surround Him, begging for blessings and confirmations. When He returns to His home afterwards He offers praise and gratitude for the confirmations of the Abhá Beauty." Don't those days sound heavenly? Mahmud is evidently inspired, as he is waxing eloquently with description. I feel a relief, now that the Master is here. The yearning for Him has been so palpable! He stayed in a rented house at 1815 California Street--apparently furnished. It may be that Mahmud's date is wrong, as Rob Stockman writes: "They had been waiting for `Abdu'l-Bahá in anticipation for days. Juanita Storch (1895-1987), then seventeen, recorded in her diary on October 1 that 'we have expected Abdul Baha for so long that it is hard to realize he will really be with us soon.' They had hoped he’d be there on that day; on October 2 she reports that “the train didn’t arrive so we cannot have a meeting.” But on October 3 a Bahá'í friend, Mrs. Berdette Matteson, stopped by to tell them 'Abdul Baha arrived last night and would be at Mrs. Goodalls this afternoon to meet us all. I was so happy I could hardly get ready.' The Mattesons took Juanita with them in their automobile." So it appears that He arrived late on Oct. 2. I am placing the photo of Oakland above, as it gives a feeling of the friends in the area. . . .